In addition to construction and other heavy-duty equipment industries, high-pressure custom hydraulic hoses are also used in industries that include military, defense, and avionics. Airport ground support equipment relies heavily on American hose and hydraulic safety guidelines to ensure that everything from loading systems to auxiliary power units is running effectively and efficiently. Regular inspections and preventive maintenance with supplies from a local hydraulic hose repair shop near Fall River are essential for any industry, but when the equipment that would be impacted by a failure could result in serious downtime for air travelers and air safety, it is even more important. When it comes to the avionics industry or any other professional business, you need to take time to prepare for the failure of hoses and hydraulic hose safety in the workplace. Reading the manufacturer’s recommendations and schedule for maintenance based on usage and environment should be a top priority. The more you can learn about the type of fluid in the hydraulic system and the custom hydraulic hoses and hose assemblies that are used for conveyance, the easier it will be to handle issues when they arise. Safe handling procedures and safety requirements for replacing hydraulic hose assemblies should also be something that anyone who deals with hydraulic equipment needs to know. Most replacement hydraulic hose is not carried in on-site maintenance inventory. The reason for this is that the shelf life for custom hydraulic hoses is limited. For hydraulic hose safety and best results, contact a local hydraulic hose repair shop near Fall River for same-day orders of replacement hoses. Choose only top quality American hose and hydraulic safety procedures to ensure best results. At Metro Industrial & Marine Supply, we can create custom hose assemblies while-you-wait at our New Bedford location. Knowing where to go to get the proper assembly made can help reduce downtime and get your equipment back up and running quickly after a failure. In the avionics industry, there are many uses for hydraulic systems and equipment. For the sake of this article, we will discuss the ground control equipment that is used at most airports from small, regional air centers to international airports. Auxiliary power units or APUs use custom heavy-duty hoses to convey fluids throughout the hydraulic system. Even loading systems utilize hydraulics for lifting and lowering, conveying, driving, steering, and braking. A combination of different materials for high-pressure hoses are used in these instances. Deicer equipment uses hydraulics to remove ice from the airplanes and the runway. Runway and taxiway snowplows are also used at many airports in New England. Plow movement is powered by the hydraulic system, and heavy-duty hydraulic hoses are required to effectively convey the fluid for proper use. The importance of using the proper American hose and hydraulic safety approach for your avionics equipment or other heavy-duty industrial equipment cannot be overstated. 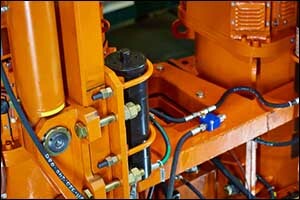 The correct components and the safest, highest quality custom hydraulic hoses and assemblies should always be used. An easy way to remember all of the component requirements for custom hydraulic hoses is to use the acronym STAMP, which stands for Size, Temperature, Application, Media, and Pressure. All of these parameters are essential to the success of hydraulic hose safety for your professional equipment. If you aren’t sure what you need, you can always contact our hydraulic hose repair shop near Fall River to discuss your requirements. SIZE – The “dash number” or measurement of the inside diameter (ID) of your hydraulic hose identifies the size of the hose or fitting; you can find it on the hose layline or stamped on the fitting; size is essential to maintain proper flow velocity. TEMPERATURE – You want to get replacement American hose and hydraulic safety right when it comes to temperature; this includes not just the temperature of the hydraulic fluid, but also the environment in which it will be used; temperature can have a major impact on hose materials. APPLICATION – Consider the way that the hose will be used, including any contact that it might have with other materials, parts, or surfaces; note the bend radius and any routing that must be achieved to prevent the hose from stretching, being compressed or kinked during use. MEDIA – The materials used to make the custom hydraulic hoses is important, ensuring that it is compatible with the hydraulic fluid that is being conveyed through the system. PRESSURE – The working pressure of the system, as well as any spikes or surges during operation, must all be taken into consideration for replacement of custom hydraulic hoses and hydraulic hose safety. If you are looking for a hydraulic hose repair shop in Fall River and the surrounding area, look no further than Metro Industrial & Marine Supply. We provide a wide range of services for custom American hose and hydraulic safety, designed to meet or exceed your expectations. Give us a call at 508-996-8400 to speak with one of our technicians or stop by our shop located on Coggeshall Street in New Bedford, MA.